Successfully Added Solar Powered Lighting - 1800mAh Battery, Red Green Blue LEDs, 160 Lumen, IP68, 50000 Hours Life to your Shopping Cart. Solar Powered LED light bring efficient cost effective lighting wherever you need it. This solar powered outdoor spotlights set with IP68 rating is the most environmentally friendly and cost effective way to enhance the charm and beauty of your garden, patio, water features or yard. 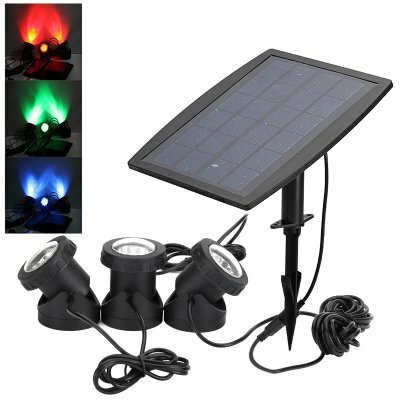 This solar powered outdoor light set is quick and easy to install with no AC or DC mains connections it can be set up in a matter of minutes in perfect safety without needing an electrician. The three LED lamps contain 6 LEDs each and bring red, green and blue lighting that is perfect for setting an enchanting atmosphere for your garden, pond, patio or decking areas. This decorative outdoor lamp is powered by an 1800mAh battery that is easily recharged with the efficient solar panel that captures the sun's rays for recharging the battery through the day, so when night time comes it can power up the LED lights. The Solar panel and battery can easily be mounted on a wall, fence post or fixed on the ground using the mount and screws provided. With a 3.2 meter cable between the lamp and solar panel youhave plenty of freedom to position the lights where you please and still keep the solar panel positions to capture as much sun as possible. With a combined 160 Lumens of light this IP68 rated LEd Lamp is dust and waterproof making it perfectly suited to your outdoor lighting needs, so you can make the most of your garden no matter the time. This outdoor LED comes with a 12 months warranty, brought to you by the leader in electronic devices as well as wholesale LED lights..